Part 1 explained how to replace the noname factory speakers with better quality Pioneer units while making the modifications to the Honda invisible. This produced a pleasant improvement to sound quality and inspired further enhancements. The plastic and metal panels found in the modern automobile are designed to save cost and provide safety. They are not rigid enough for music. Also, there are holes everywhere that cancel out the sound pressure created by speakers in the doors and trunk. So when listening to any music with bass instruments, you also hear rattling panels and strange resonances. These rattling acoustics can be fixed by using a powered subwoofer in a tuned enclosure. In addition, this fixes a problem with the bass boost control of the factory radio. 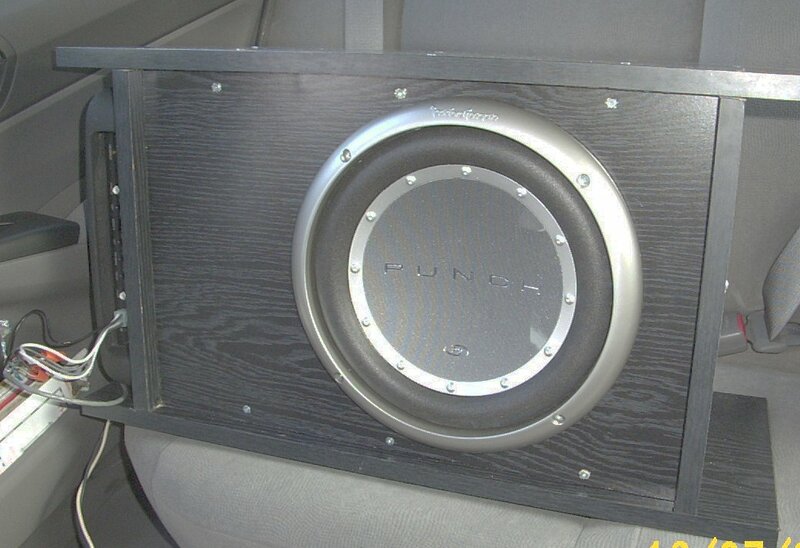 Without a sub, you also boost the midrange when boosting the bass because it has a simple rising response curve. But the powered sub has it's own boost so the door speakers can be driven from a flat amplifier that causes no panel rattling. Now you have more flexibility in creating good sound. 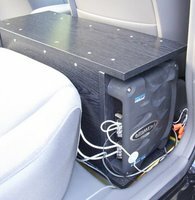 You have many options when shopping for a car subwoofer. It seems to me that Rockford Fosgate is the "WooferMeister" so I tried a P210S4. Smaller, cheaper units are available but I prefer to buy a little extra rather than not enough which would be a total waste. Enclosure choice is not so easy. Stereo stores usually sell these small, square boxes which are intended for cheap, generic speakers. They will not provide the best performance for a particular unit. 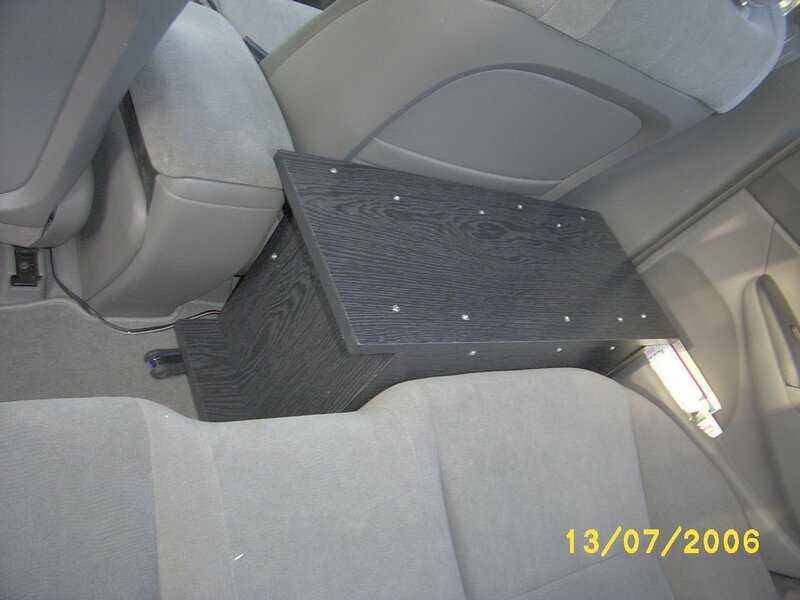 Just as your car needs tuned suspension components, your woofer needs a particular box designed for it's personality. The two most common enclosure types are sealed and vented. The vented ones are more efficient and are commonly used in home theatre systems to save cost. But a vented unit is more difficult to design so that it does not become a "boom box". Fosgate sells these nifty vented enclosures with woofers. But they double the cost of your purchase and sealed enclosures are not offered. Moreover, vented enclosures are larger than the sealed versions for Fosgate woofers. Enclosure specifications are provided with Fosgate woofers so I opted to design my own. Unfortunately, I don't have fancy-schmancy table saws and other tools for cabinet making so "creative carpentry" was needed. I purchased three 10" x 24" black, multipurpose shelves and one 12" x 36". I cut the 12x36 in half to get two 12x18. I cut one 10x24 in half to get two 10x12. The 10 inch pieces became the sides of a box, the 18 inch became the front and back. It just happened to work out with two cuts. I made the cuts with a handsaw guided by a straight wood scrap. The 24" inch cut in half was slightly larger than the 12" inch so I trimmed them with the jig saw and a rasp to make them equal and just a hair less than 12". Remember, creative carpentry. The high-density particle board shelves are held together with wood screws but this is only for a start. Bracing material must be added and screws inserted through the particle board so that the sides are pulled together. This bracing can consist of strips of pine or even old hockey stick handles. These braces are hidden inside. Later, thermal glue or silicone rubber will be added around all seams for airtight operation. Note that the top and bottom boards extend over the sides. This is better for three reasons. There is something to hold onto when carrying a 50lb box. The Jansen JPA260 power amp can drive 180watts RMS when bridged into the woofer (and set to 11 like Spinal Tap. It also has bridged inputs for connecting to the existing Honda rear speaker wires. A switched low pass filter, a variable boost, and input level complete the requirements. The case of this amp is also the heat sink which gets very warm to the touch. It cools better when installed as shown since air naturally rises up over the case. The final prototype is placed on the floor and fits snugly behind the passenger seat. The woofer is facing the seat but this is ok for low frequency operation. Note that the box is partially blocking the sliding console cover. Later a small storage box will be placed under the woofer to adjust the height as a pedestal. The enclosure must have at least 0.65 cubic feet for the Fosgate woofer. My simple box is .85 which is within specification. Anyone with good tools can make a slightly smaller box.